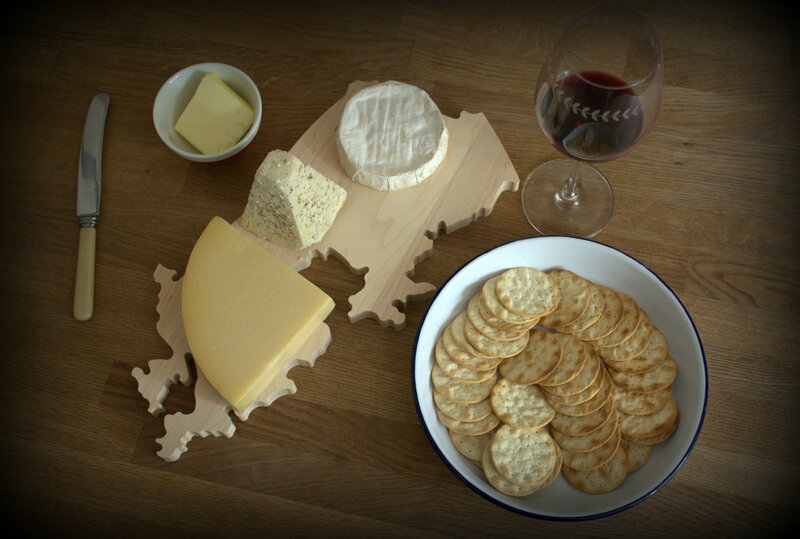 from British Columbia, that showcase Canada’s tradition of producing high-quality, great tasting cheese. 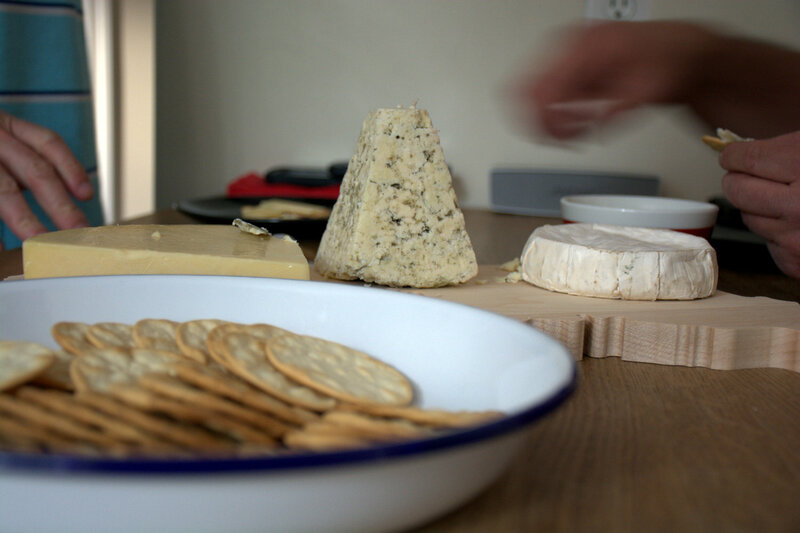 I gathered a group of cheese loving friends, broke out the crackers and got stuck in. It's a tough job, but somebody has to do it! Aged for 14 months in carefully monitored temperature and humidity conditions, this cheddar is ﬁrm in texture and has a rich full-bodied ﬂavour. Avonlea Clothbound Cheddar is a highly-awarded cheese, receiving accolades since 2008. Made by Cows Creamery in Prince Edward Island, the cheese is made with milk from local Prince Edward Island farms and because no point on the island is more than 20 miles or so from the ocean, the salt air and iron-rich red soil add to the ﬂavour and quality of their products. Devil’s Rock is a creamy blue cheese in a uniquely shaped pyramid and encased in black wax. Devil’s Rock itself is an iconic rock surface overlooking Lake Temiskaming and onward into Quebec. This award-winning cheese represents the rugged Canadian terrain of the Canadian Shield. Thornloe Cheese Inc. is farmer owned, sourcing dairy from the region of Northern Ontario where the air is fresh, the waters are clean and pastures are green. You can taste the diﬀerence in their hand making cheese practices. Comox Brie is a soft bloomy rind cheese. It has a thin and moist downy white rind, a traditional, gentle yet slightly buttery taste, pungent mushroom aromas and a delightful, creamy texture that becomes runny over time as the cheese ripens from outside in. It’s named after Comox, a small town near Courtenay, Vancouver Island, where Natural Pastures, the cheesemaker, is located. Natural Pastures is committed to making sustainable farming a priority every step of the way, including choosing milk suppliers on the island. Historically, cheese making in Canada is double-stranded, woven from the country’s rich French and English heritage – French settlers brought over methods for making soft, ripened cheeses, while United Empire Loyalists ﬂeeing the American Revolution, introduced the distinctly British characteristics of cheddar. While cheese making in Canada can be traced back to the early 1600s when French explorer and founder of the Quebec settlements, Samuel de Champlain ﬁrst introduced cattle to the region, it wasn’t until 1864, that American immigrant Harvey Farrington employed new technology to set up the very ﬁrst Canadian cheese factory, ‘The Pioneer’ in Norwich, Ontario. By 1867, the year of Confederation, over 200 cheese factories were established in Ontario alone and the foundation for the creation and production of distinct Canadian cheese was set. Dairy Farmers of Canada is the national policy, lobbying and promotional organization representing Canada’s farmers living on approximately 12,000 dairy farms. DFC strives to create stable conditions for the Canadian dairy industry, today and in the future. It works to maintain policies that foster the viability of Canadian dairy farmers and promote dairy products and their health benefits. My cheese tasting team loved all of the cheeses but my favorite was the Avonlea Clothbound Cheddar. I loved it's rich creamy taste and it had a great firm bite perfect for grating over this salad! I pan seared some thinly sliced courgette (zucchini) in a searing hot griddle pan and then drizzled them with lemon juice and good olive oil. 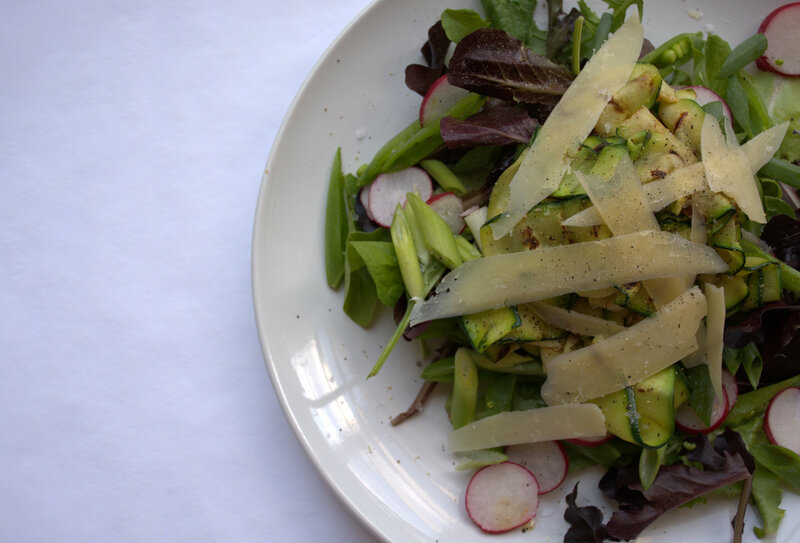 Toss the courgette and all of the lemon juice and oil with some greens, spring onions and some thinly sliced radish. 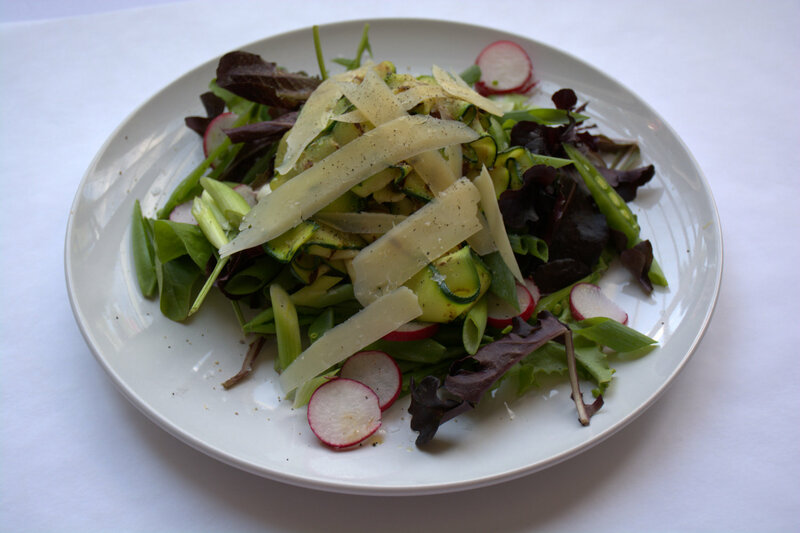 Use a peeler to slice the cheese over the salad and enjoy! If you have never explored Canadian Cheese I strongly suggest you do! There are many fabulous options out there and it was a pleasure to sample these three amazing cheese. I was sent a wonderful cheese package free of charge to test for this blog post. Images, opinions, recipes, wine and over use of exclamation marks are my very own!!! I have never tried Canadian Cheese, I will definite buy some if I have chance. Thank you for sharing!